Director Wayne Salomon works his magic once again with Nicky Silver’s already hilarious script of the ultimate dysfunctional family in “The Lyons,” the final offering of the season at Max & Louie Productions. Father is dying and cantankerous, mother is self-centered and detached, daughter is a recovering- but not quite fully recovered- alcoholic and son is gay but can’t sustain any relationship in his family or his non-existent social life- including those he makes up. Toss in a wise-cracking nurse and a psychotic real estate agent and you’ve got the makings for a funny, occasionally touching and always incredible journey through life, death and everything in between. 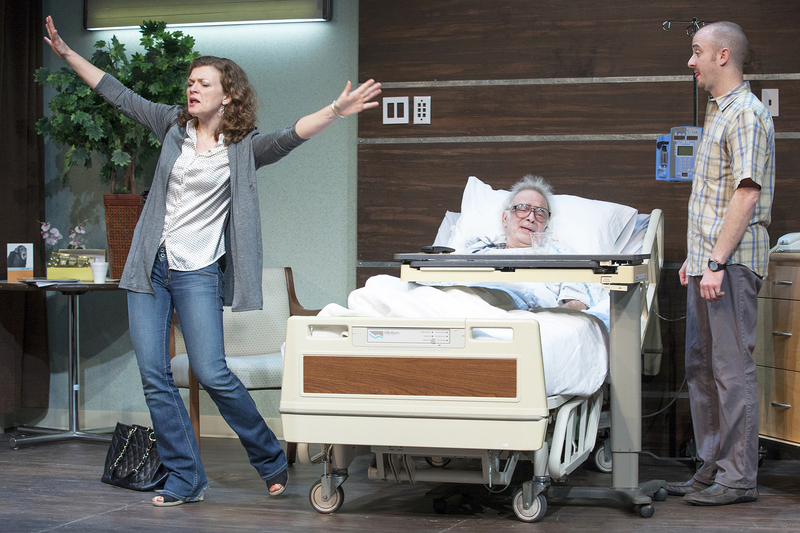 Bobby Miller is still at the top of his game as he acts and reacts beautifully from a hospital bed in the first act where he, as Ben Lyons, is waiting to die from cancer invading his entire body. Everything seems to irritate him- especially his exasperating wife who seems more interested in changing the decor of her living room than the fact that her husband is about to die. Trading epithets and salty language, the two don’t appear to have been functioning as a unit since they first got married. 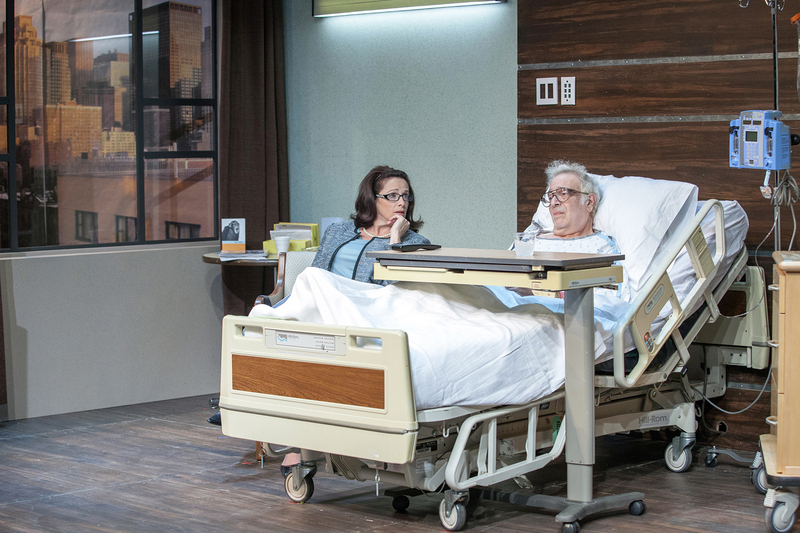 But despite ranting from a hospital bed, Mr. Miller draws the attention with his oversized glasses and pithy remarks- all the while reacting to everything and everyone around him. From dabbing his napkin into a water glass to get some much needed moisture to his lips to purposely exaggerated reactions to what is being said about him, he is a delight to watch and listen to as Mr. Silver’s brilliant dialogue falls effortlessly from those napkin-moistened lips. Coming out from a too-long retirement to play his wife, Rita Lyons, is the wonderful Judi Mann. She hasn’t lost a step as she tossed off one-liners like bon-bons to a hungry audience waiting for her next zinger. She freely admits at one point that she couldn’t resist the loving look on Ben’s face when they first met and, although she hoped to eventually fall in love with him, she never did. But it seems she never really fell in love with anybody- her husband, her children or her friends. She pages through architectural magazines hoping to find something new for her living room where- as she puts it- “even the carpet has been matted down with resignation.” And further proof of her detachment from her family comes when it’s discovered she had a gun for about a week and planned to shoot Ben. “I got rid of it,” she said, “it was just a whim.” Let’s keep Ms. Mann on stage in our town- what a treat it is to see her taking command of a character again. The delightful Meghan Maguire (winner of last year’s Best Actress St. Louis Critic’s Circle Award for “Talley’s Folly”) plays the daughter, Lisa, who is coping with alcoholism, a non-attentive sponsor for same and the sudden re-entry into her life of her errant husband who used to beat her. She’s not very sure of herself and thus has trouble coping with life in general and now is upset that her father’s impending death was suddenly sprung on her and her brother even though her mother knew about it for some time. Her sudden return to the bottle emphasizes her weakness and the weakness of the family Lyons in particular. Ms. Maguire manages to make her character equal parts sympathetic and perplexing, making for lots of laughs and some heart-wrenching moments as well. Son Curtis is given a powerful performance by Charlie Barron. His father was disappointed when no one else wanted to call him “Hilly” after his father and then later was disappointed again with his sexual orientation. Although Ben claims that his son doesn’t like him either, there’s some real love displayed but again that anti-social bent to his character won’t allow him to carry on a relationship with anyone. He has made up an imaginary lover who he calls Peter but the family soon finds out that he doesn’t exist. Mr. Barron gets to really display his acting chops in the second act when he takes over his father’s bed in the hospital after being pummeled by an aggressive real estate agent who he manages to alienate when we discover this was the inspiration for his “Peter” fantasy. 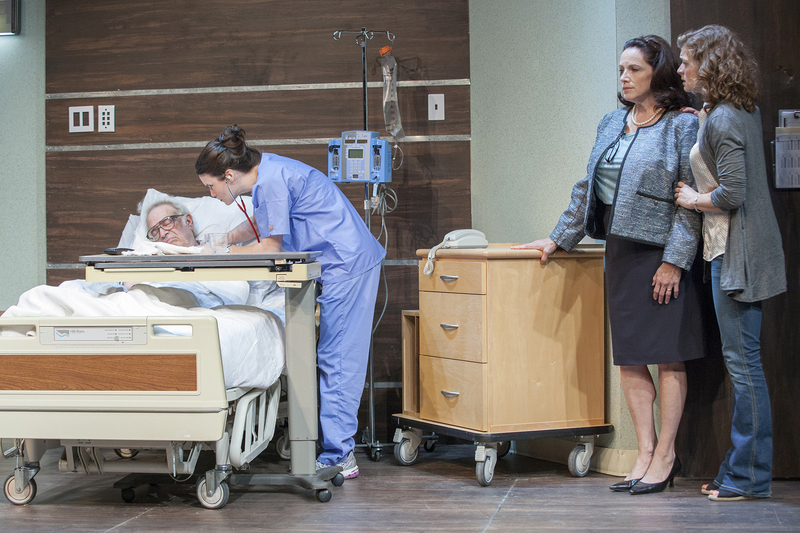 Julie Layton is simply perfect as the snippy nurse who also gets to shine in the second act when she tries to intimidate Curtis as he refuses to eat his hospital food. In a way, she reflects the Lyons family with her off-hand manner and often flippant attitude. A performance that fits right in with their dysfunctional lifestyle. Rounding out the cast as that bellicose but belligerent real estate guy played with that mixture of nice and nasty by Aaron Orion Baker. It’s a fascinating scene that opens up Act II as Curtis is looking at a one-room apartment but it soon turns ugly as secrets are revealed and boundaries are crossed. 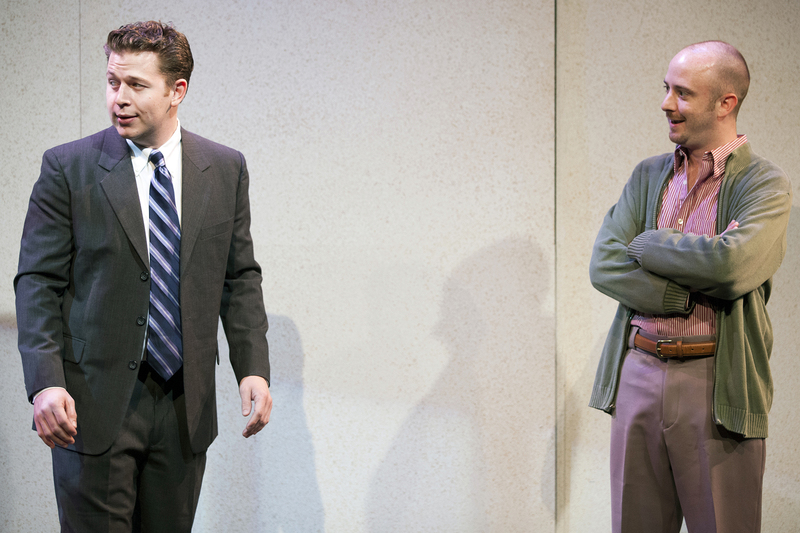 The Justin Barisonek set design is properly functional and is enhanced by the Maureen Berry lighting design. Kevin Reed’s costumes are right on the mark and Amanda Werre’s sound design set the mood perfectly. One sad note from this production- one of the beloved puppies that this company was named after- Louie, died on July 31st at the age of 12. For enough laughs for a lifetime, get down to COCA’s Black Box Theatre and catch Max & Louie’s production of Nicky Silver’s “The Lyons.” With a great cast and pin-point precision direction that keeps the action moving, this is the one to see. Give them a call at 314-795-8778 for tickets or more information. This entry was posted on August 23, 2013 at 9:43 pm08 and is filed under Uncategorized. You can follow any responses to this entry through the RSS 2.0 feed. You can leave a response, or trackback from your own site.